The OED’s first listing for “plastic,” sense A. 1a, reads: “the art of modelling or sculpting figures, esp. in clay or wax.” Richard Haydocke furnishes the first and second instances of the word’s usage in his 1598 translation of G.P. Lomazzo’s Tracte Artes Paintinge: “Painting, Carving and Plasticke are all but one an the same arte” and, later, rather tendentiously, “Carving is nothing else but a painefull imitation of Plasticke.” As use multiplied over the succeeding years, so did meaning. Within decades, the word had designated not just the method of artmaking but also, at times, the artist who employed such methods, the resultant artwork, as well as “the creative or procreative principle” more generally. Meanwhile, these nominal uses acquired adjectival counterparts.1 Curiously, although the word has a Greek root, πλαστικός, meaning “that may be moulded,” and although “plastick” was used to indicate pliancy in abstractions, such as virtue or truth, in the mid-seventeenth century, it did not refer broadly to moldable physical substance in English until the end of the eighteenth century. Still, the term was ready for application when, in the early nineteen-hundreds, the first materials made entirely of synthetic polymer were developed. And thus “plastic,” originally introduced into English via Italian during a discussion of visual art, assumed its most common contemporary meaning: the designation of a class of synthetic materials and products. Modeled clay studies would’ve preceded the casts. Around the same time, “plastic” began to circulate throughout prominent writings of the avant-garde, particularly of the De Stijl group. In point six of “Manifesto 1,”2 these Dutch artists identify themselves as “the founders of a new plastic art.” Over the years, “plastic art” had been used to refer to, first, modeled sculpture, later, all three-dimensional art and, eventually, any art, including painting, that sought to represent three dimensions. Theo van Doesburg, chief author of the 1917 “Manifesto,” wanted to express something beyond the mere representation of round, inhabitable space. For him and for the other members of the group, “plasticity” suggests a work’s abstractness. 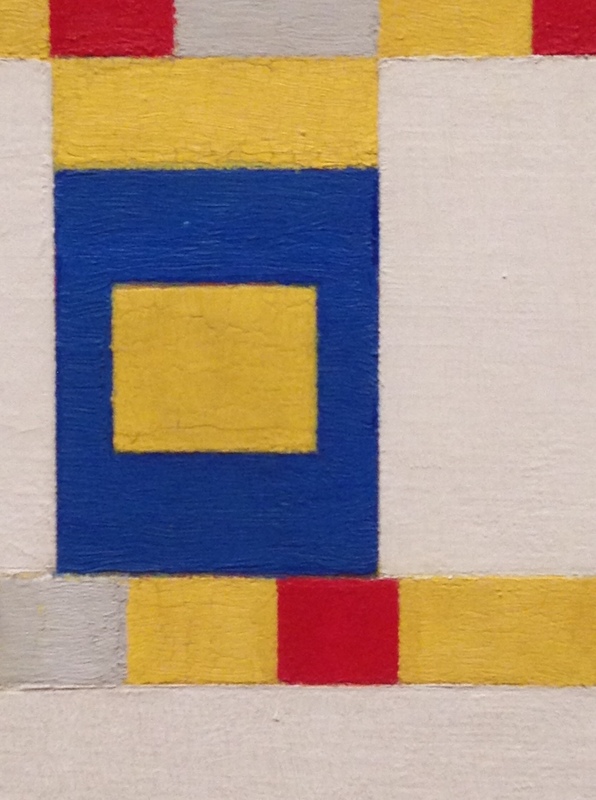 Van Doesburg’s later Principles of Neo-Plastic Art provides a helpful example. There, he considers “old paintings, e.g., by someone like Nicolas Poussin,” pointing out that “such a painting is in a high degree true to life and yet, as a result of definite intentions on the part of the painter, it differs from nature.” Poussin’s art, van Doesburg explains, is willfully designed: “the artist was working according to artistic and aesthetic laws (constructively organizing) and not purely from the point of view of natural objective legibility.” This is plasticity. But the new plastic art goes further, rejecting representation of “natural form”; in other words, they champion a pure3 or what’s often called “non-objective” abstraction. 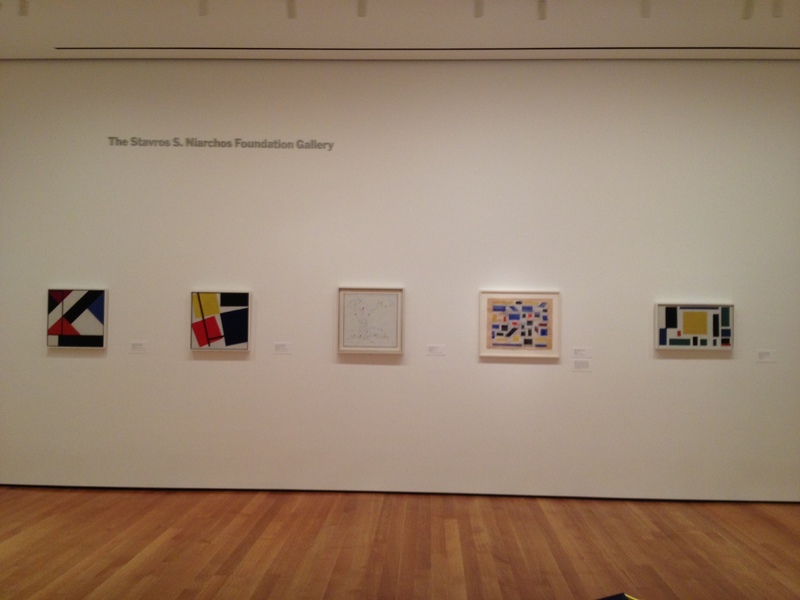 De Stijl: on this wall, left to right, van Doesburg, van Doesburg, van der Lek, van der Lek, van Doesburg; on the opposite wall (not pictured), Mondrian. Bracing stuff, these manifestos and pronouncements. Some readers may find the scope and certitude exhilarating. Others, after one or another of these oracular statements, may find themselves rather nonplussed, like Dustin Hoffman’s graduate confronted with the single, portentous word: “plastics.” If the De Stijl sense of the word sounds abstruse,5 that’s okay. 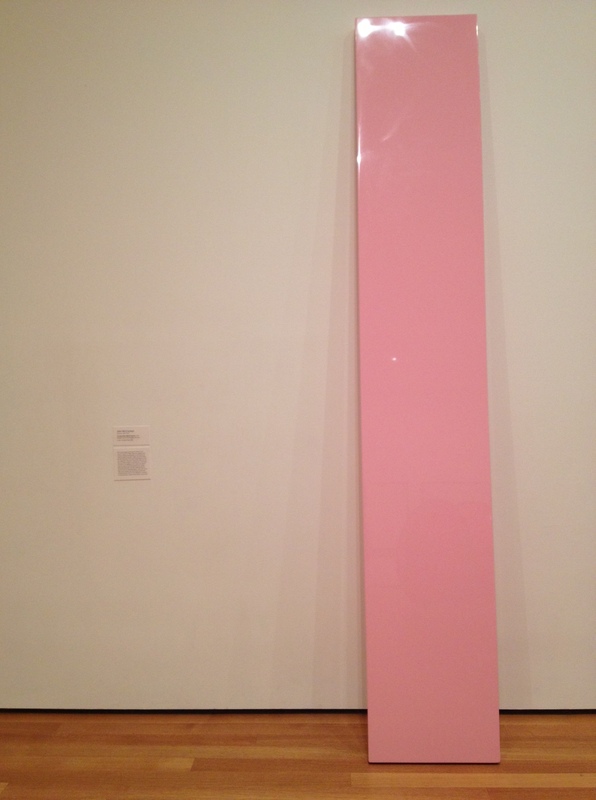 The occasional exception aside, postwar contemporary artists largely have used and thought of “plastic” as everyone else does. For Louis, synthetic polymer was the basis of a new kind of paint, which, lacking the fats that will degrade fibers, could be poured directly on unsized canvas. When Donald Judd built a plexiglass box or John McCracken covered lumber in fiberglass, they were taking advantage of a sleek, clean material that had no direct association with art of the past. 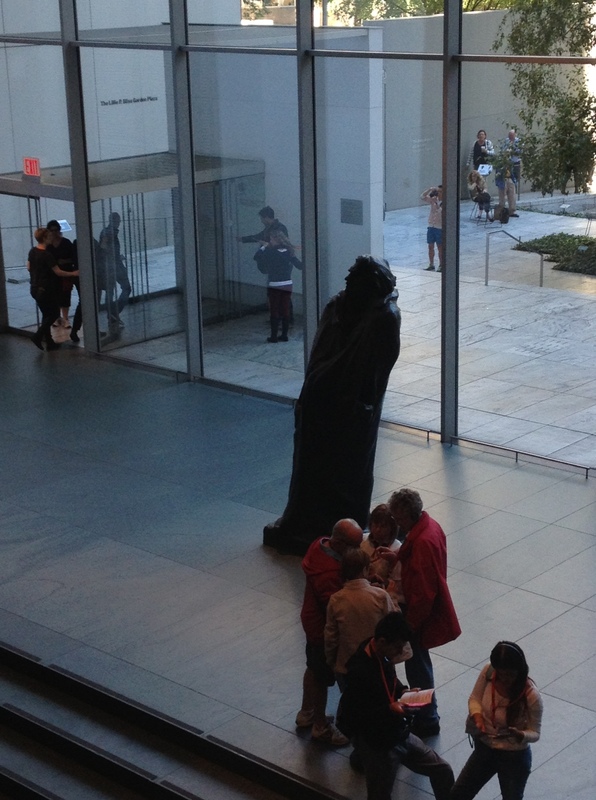 Most art museums that cover modern and contemporary periods will, at any moment, have on display examples of each of the senses of “plastic.” All the photos that illustrate this post were taken on a single afternoon at MOMA. I wouldn’t argue it’s anything other than etymology and accident that associate these works. Still, there are echoes. “Plastic” has had a dodgy history, those helter-skelter early years in particular. The temptation to glibly dub “plastic” a ” flexible word” is great. But the multiplicity of meanings likely has more to do with a particular span of history than with anything inherent in the term itself. Considering the present: there’s maybe a certain inertia that follows in the wake of technologies promising easy and widespread access to aggregated knowledge. Still, plastic– the material– is itself technology, and its role in society is evolving. I won’t speculate on the further evolution of the word but, instead, remark that this etymology implies a particular a account of the last four hundred years of art history. From craft to metaphysics to literal materialism, this account is probably as instructive as any other. 2Here I’ll point out the shaky ground I’m on. I’ve begun with a gloss of the etymology of “plastic” in the English language; I am now discussing that word’s usage by a Dutchman writing in his native language. My defense on this point, admittedly lame, is threefold: 1) I am trusting the translators. 2) Please note, I’m not implying direct connections, just making associations. 3) The words, through translation, have entered the English language as they are. 4This is firmer ground. 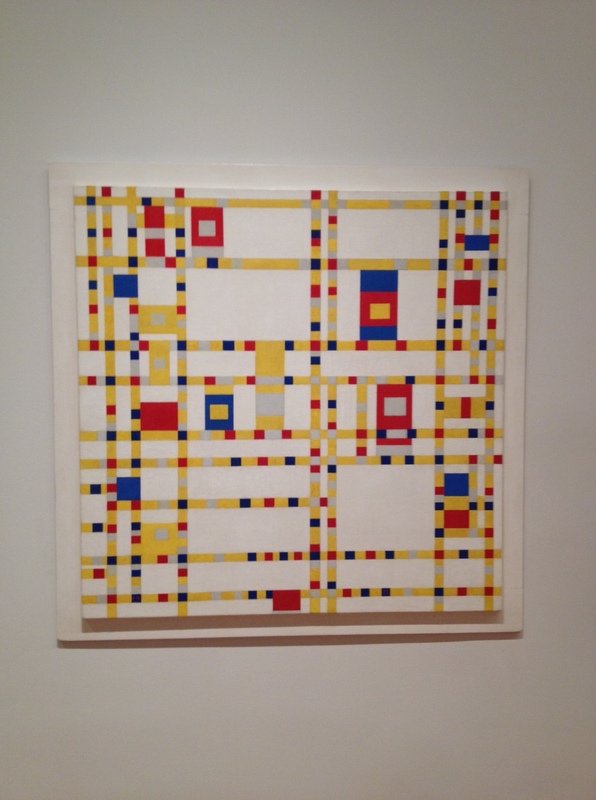 “Plastic Art and Pure Plastic Art” was first published in Circle and, according to Britannica.com, was Mondrian’s first essay written in English. 5When it does crop up, it’s usually historicized. Over the past summer, MOMA exhibited Ellsworth Kelly’s Chatham Series; outside the main galleries hung his 1951 drawings for Line Form Color, which the label indicated “would be ‘an alphabet of plastic pictorial elements. '” Quietly, it was a banner season for plasticity at the museum: concurrent shows included Inventing Abstraction and Le Corbusier: An Atlas of Modern Landscapes.